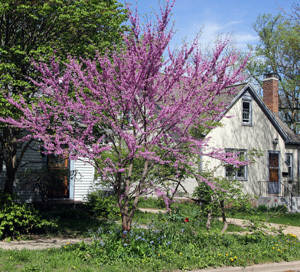 Eastern redbud is a small tree commonly used in Midwestern landscaping. 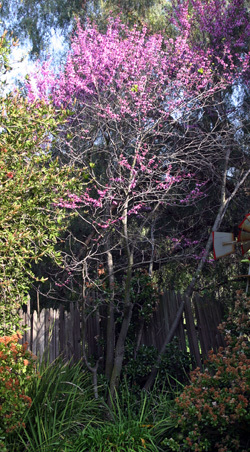 Western redbud in a backyard in California. south of Wisconsin, many northern strains of this plant have been growing in the southern half of the state for decades (from along a diagonal line from La Crosse to just north of Green Bay). Commonly called eastern redbud, this deciduous tree in the legume family (Fabaceae) is commonly used as an ornamental in gardens and landscaping in zones 4 to 9. Eastern redbud is the state tree of Oklahoma. There are two varieties of this species with smaller, glossier leaves and often a more compact form that occur in Texas and Mexico, as well as the related western redbud, C. occidentalis in Arizona and California – none of which are hardy in the Midwest. Redbud forms a rounded shape if grown in the open. Eastern red bud typically grows 20-30 feet tall with a short trunk (or several trunks in multistemmed individuals) and spreading branches to form a broad flat or rounded crown. Young plants have an upright vase growth habit and will develop an irregular shape if not grown in the open. The scaly bark has deep fissures for ornamental interest in winter. Trees grow quickly when young, then have a medium growth rate. 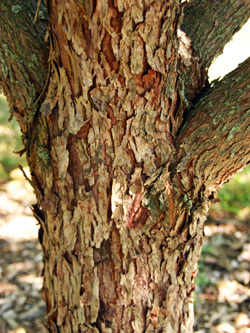 The dark red brown bark has a scaly surface and forms deep fissures to expose the cinnamon-orange interior. On older trees there can be dark purplish patches on the bark, and the trunk may become twisted with age. The slender, zig-zagging stems are dark, almost black, with lighter colored lenticels and tiny, rounded chestnut brown buds on the tips through the winter. Redbud is one of the first trees to bloom in spring. Redbud is one of the first trees to bloom in early spring. The numerous reddish purple buds start opening before the tree leafs out for a very showy display for about a month when most other trees are still bare. Trees may bloom profusely even when very young. It is a cauliflorous tree, producing clusters of 4-8 flowers in fascicles at the axils of the leaves and along the branches and sometimes on the trunk, but most are on two-year-old wood. The flowers range in color from light rosy pink to dark magenta, and there are white forms. Each typical pea-like flower is about ½ inch wide, with 5 petals and 10 stamens. The flowers are visited by many pollinators, but only long-tongued bees can reach the nectaries. Flowers are produced in dense clusters along the branches (L and LC). Each typical pea-like flower (RC) has five petals and 10 stamens (R). The flowers are followed by flat, pea-like pods, although many trees are sterile and produce no fruit. These pods start out green, but eventually turn brown when they mature in mid- to late summer. Each of the 2-4 inch long pods contain 4-12 flat, elliptical brown to black kidney-shaped seeds. When numerous, the pods may detract from the appearance of the tree, but heavy fruit crops do not occur every year. The pods can be persistent or fall in early winter. Under ideal conditions it will self-seed, but usually not to the point of being problematic. Flowers are followed by flat, pea-like pods (L) with 4-12 flat seeds (LC). The pods eventually mature to brown (RC) and eventually release the many seeds (R). The leaves are usually heart-shaped. The leaves are a bright green tinged red when they first emerge from the winter buds, changing to dark green above and paler below when fully expanded. 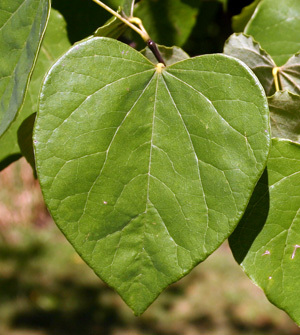 The alternate, cordate (heart-shaped) to broadly ovate leaves have smooth margins and prominent veins. 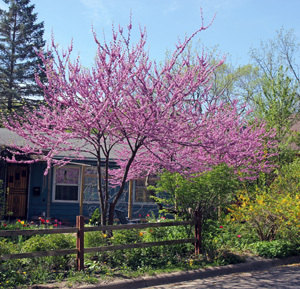 Redbud is common in residential landscapes. The thin, papery leaves on slender petioles may turn a bright, clear yellow color in the fall in some years, but good fall color is unreliable. Both the species and several cultivars are grown in gardens and parks, in residential and commercial landscapes, or as street trees or foundation plants. It can be used alone as a small specimen or in small groupings. It combines well with other shrubs and perennials in a mixed border and works well as a naturalized planting along a forest edge. As a relatively small tree, it is well suited to smaller properties and as a patio tree. 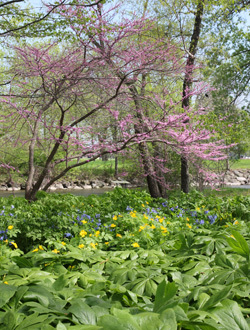 A redbud tree through the seasons: winter (L), spring (LC), early summer (RC) and early autumn (R). ‘Ace of Hearts’ is a compact selection (to about 12 feet high) hardy in zones 5-9 with light violet flowers. ‘Alba’ has white flowers that bloom a little later than the species. ‘Appalachian Red’ has deep red purple buds that open to bright pink flowers. ‘Covey’ (Lavender Twist™) is a weeping form, with stiff, contorted stems. ‘Flame’ has double rose pink flowers and seldom sets fruit. It is more erect than the species. ‘Forest Pansy’ has vivid reddish-purple leaves in early spring that changes to dark green on the upper surface later in the season. It tends to bloom later than the species with darker colored, almost purple, flowers. This cultivar received the Royal Horticultural Society’s Award of Garden Merit. Originally found as a seedling in 1947 at Forest Nursery, McMinnville, TN, information on its hardiness is somewhat conflicting. The eastern redbud cultivar Forest Pansy has reddish leaves (L and R) that change to dark green in summer (C). ‘Heart of Gold’ has bright yellow leaves. ‘Northland Strain’ is a very cold-hardy selection from Minnesota. ‘Pinkbud’ has clear pink flowers. ‘Royal White’ has white flowers that are larger and earlier-blooming than ‘Alba’. ‘Silver Cloud’ has variegated foliage irregularly splotched with white, but green reversions occur that must be removed. It does not flower as heavily as the species. Eastern redbud grows in full sun to part shade. 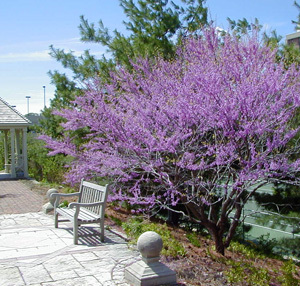 Eastern redbud can be grown in full sun to partial shade, although the best flowering will be in full sun. Although it is tolerant of clay soil it does best in moist, well-drained deep soil. It can tolerate drought, but does better with regular watering. It requires pruning when young to develop a good shape and strong structure. The species can be propagated from seed, but cuttings or bud grafting is done for the cultivars. This species does not transplant well because it develops a deep taproot, so it is best to plant young trees. It is important to have the right genetic material as cold hardiness varies considerably. Twig kill and dieback in colder zones is not uncommon. Some other drawbacks are that the wood can be brittle with older trees splitting at crotches and branches breaking off in wind and a heavy snow, and this species tends to be short-lived, especially if stressed. It is tolerant of juglone, so can be grown under black walnut. 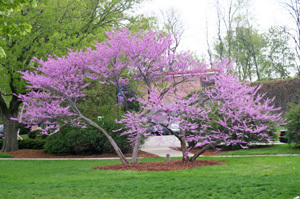 Redbud has few insect pests but is susceptible to some diseases. It has few insect pests other than scales and is not favored by deer, but is susceptible to Verticillium wilt (especially in wet sites) and Botryosphaeria canker. The species is easily propagated from seed, but the cultivars must be budded onto seedling rootstock or propagated by summer cuttings. Fresh seed can be sown directly into the field in the fall, but mechanical scarification or hot water immersion followed by moist stratification for 5-8 weeks is required for germination of dried seeds to be planted in outdoor seed beds in late spring. Many nursery redbud varieties are unfortunately grafted on apple tree rootstock; check area for anything detrimental to apple trees (eg black walnut or buckeye), which could kill a grafted “redbud” via juglone toxins. I am in possession of quite a few Pansy Leaved Redbud Tree seeds. I live about 20 miles north of Houston Texas and these seeds were taken from a tree a little south of Houston. I would like to germinate these seeds and eventually sell the seedlings at around 3-4′ tall. Can you give me some advise on germination procedures and how to maintain seedling trees until old and large enough to sell? There are two white flowering redbud trees growing in the landscape of a strip mall near where I live in Westfield, IN. I have watched them over several springs and decided to collect some seed pods in the fall to see if I could get a small tree to grow. The second spring after scattering some seeds into the ground, there was a little redbud tree that had sprouted and was growing! Can I expect this little tree to bloom white? is there a chance that it would revert back to the species? I have searched the internet in vain to find this kind of information- not much out there on growing white flowering redbuds from seed. I did read that a cultivar will not come true from seed, if it even has any. If that is true, then Royal White can not be grown from seed, but alba can, right? With having this information, I am assuming that the trees at the mall are Cercis canadensis ‘Alba’. Thank you for your time! hello, we have a mature redbud growing in full sun and was quite healthy here in central MO. the tree had several limbs overgrowing several adjacent shrubs and in my ignorance i cut back several limbs from one of the two main stalks in mid to late fall. this spring that same half of the tree back did not flower or grow leaves, wheras the other half looks normal. is it dead, or will it take time to come back, or could we hire someine to cut it down carefully so the other half continues on? or could we graft with buds or cleft to try and save it without cutting half of it down? its not yet super hot here so i think careful graft might work, if mature tree has history of taking grafts and we can time it right. thanks! You should contact your local Extension service and they can advise you as to what is appropriate for your area. I have an Eastern Redbud that I purchased from a nursery that has since gone out of business. I paid around $160.00 for it and the first year it never made it. The nursery replaced it. It would bud a little for the next couple of 3 years. Now it is doing nothing. I kept hoping but I am pretty sure the tree is dead now as the branches are very dry, brittle and break right off. I am not sure what I did wrong if anything. Do you know where I can purchase a hearty eastern redbud. I love the tree and would love to have one in my yard again. Because this tree naturally occurs over a very wide area of the country, there is considerable variation in hardiness, so you need to get a tree that was produced locally from hardy stock. 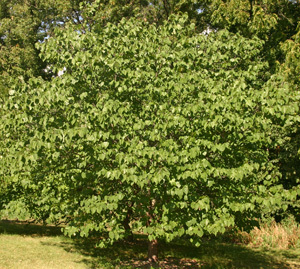 You should contact your local county UW-Extension office (http://counties.uwex.edu/) and they can recommend a source for trees that should be hardy in your area. They can also offer advice on how and where to plant for the best success. 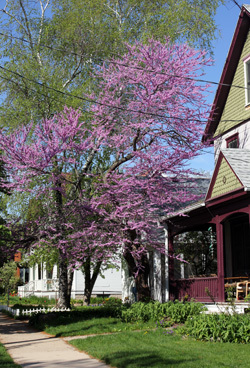 In my experience, Eastern Redbuds take special attention to get established. My guess is that your tree death was watering-related. The issue w/ any tree is to motivate the roots to grow out from the nursery root ball, downward (most important) and outward as much as possible. To do this generally speaking, the rule is water infrequently but deeply (i.e., not every day, but when you water, *soak* the ground). Second rule of thumb is don’t water just the area containing the root ball – if you do that the tree has no motivation to put out roots outside of the the rootball. Ergo, watering stops = tree dies. It might as well still be in a pot; the tree never becomes self-sufficient. We got a species cercis canadensis in 2008 and irrigated it religiously for four years – automated, on a timer. We did two concentric rings of soaker hose around the trunk: one about 8 inches larger than the approximate diameter of the root ball and one at the drip line (approximate outer perimeter of the branches). We did this because having hose only at the dripline (the general rule of thumb to force root growth reaching for the water) was simply not getting enough water to the tree – it was stressed. Way more persnickety than any other three that we’ve planted (and we’ve planed many). After year 2, we removed the “rootball” or inner (smaller diameter) soaker hose and continued to use only the outer, dripline hose for two more years – at this point, the tree could handle being forced to work harder, growing roots outward. As to time and frequency of watering: we watered it 4x a week for the first year; tapering down to 2x a week by year 4. After that, the tree was established. Now, no matter the weather or drought, it evidently has roots deep enough to get water reserves deep in the soil. We live in the NE USA.